The Society of Children’s Book Writers (SCBW) was founded by Stephen Mooser and Lin Oliver in 1971. To recruit additional members, they placed ads in popular writers’ magazines. The first person to respond to these ads and join the organization was Sue Alexander. Shortly after that, children’s book author Jane Yolen met Sue Alexander at a writers’ workshop at Temple Buelle College (now part of Johnson & Wales University) in Denver, Colorado. 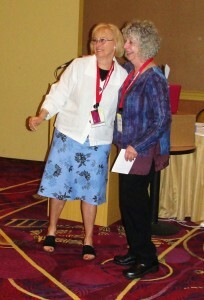 Sue told Jane about SCBW, and Jane immediately joined, becoming the organization’s second member. In 1972, Jane Yolen was invited to speak at SCBW’s first national banquet. She asked Steve and Lin if she could start a critique group and organize an East Coast conference. 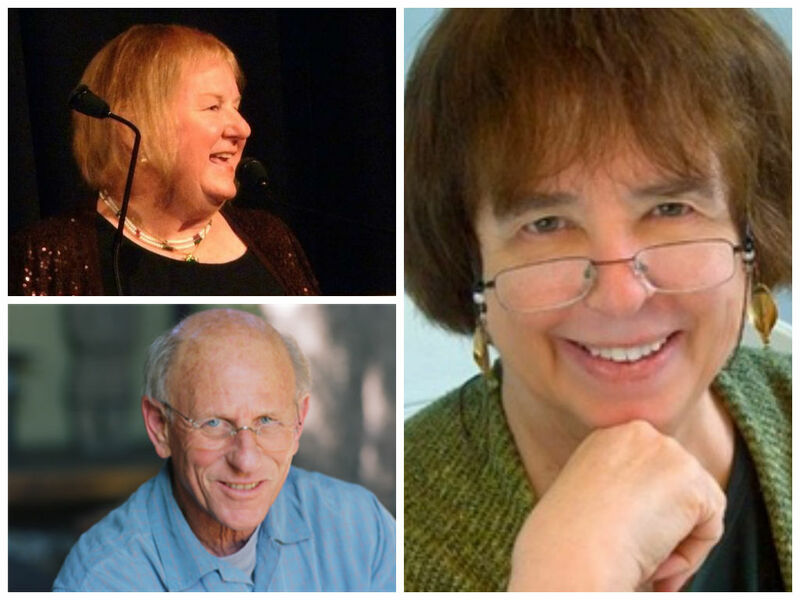 They agreed, and the New England Region was born with Jane Yolen as the first Regional Advisor. Jane quickly established a critique group at the Hatfield Public Library in Hatfield, Massachusetts, and led the group’s monthly meetings for 25 years. When Jane stepped down as leader, the group adopted a system of rotating leaders, which included Peg Davol, Nancy Sippel Carpenter, Nancy Hope Wilson, and others. Jane also planned the first SCBW Children’s Book Writers and Illustrator’s Conference, which was held in 1973 in Northampton, Massachusetts. For the next 9 years, Jane ran the SCBW New England Conference single handedly. 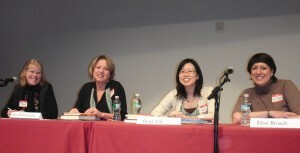 The event included a keynote speaker, panels of authors, and a presentation by an illustrator. At lunch, each table was presided over by a published author, illustrator, or editor, so that every attendee could have a personal conversation with an established member of the publishing industry. Today, SCBWI groups all around the globe have adopted this practice, which Jane first instituted. In 1980, after receiving some initial guidance from Jane Yolen, Sue Burgess established a SCBW critique group at the Boston Public Library in Boston, Massachusetts. 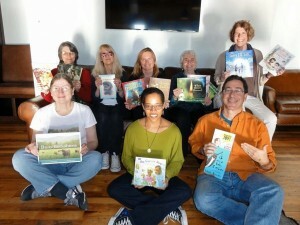 The initial participants were former members of the New England Authors and Illustrators of Children’s Books. 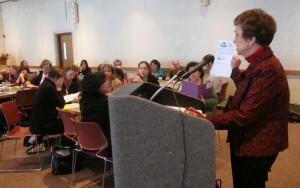 Sue also began writing and distributing the SCBW Boston-Area Workshop Newsletter, which included membership updates and local events of interest. Now called the SCBWI NE NEWS, it is the oldest continually-published regional SCBW(I) newsletter. In 1981, Sue Burgess established a second critique group at the Westwood Public Library in Westwood, Massachusetts, and began encouraging other writers in eastern Massachusetts to create additional critique groups. In 1982, with input from Jane Yolen, Masha Rudman of UMASS, Amherst’s School of Education planned the first Perspectives in Children’s Literature Conference, which was geared toward educators. In 1983, Jane Yolen resigned as the SCBW New England Regional Advisor and Sue Burgess agreed to fill the position. Two years later, Sue was named SCBW member of the year in recognition of her hard work and dedication. During this golden age of children’s publishing, the school and library market boomed and many trade publishing houses expanded. Children’s book offerings became more numerous and more diverse than ever before. As a result, an increasing number of people became interested in writing and illustrating for children, and many of them turned to SCBW for help. 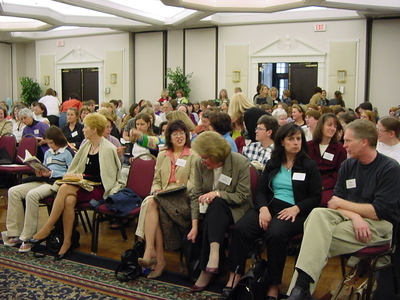 Perhaps inspired by the publishing industry’s momentum, Margaret Ribaroff and a group of hard-working volunteers organized a SCBW New England Regional Conference at Fairfield University in Fairfield, Connecticut in 1987. Our region has continued to offer an annual conference ever since. Today the annual SCBWI NE conference is one of the largest in the world. In 1989, Sue Burgess passed the torch of leadership on to Jane Mruczek. By this time, the Region had more than five hundred members and around twenty critique groups. Jane Mruczek quickly realized that running the New England region was no longer a one-person job, so she created a Steering Committee—a core group of volunteers who would work together to plan and oversee SCBW activities. With this enthusiastic and committed group in place, the Region was able to offer many more special programs for its members. Through a series of discussions, the Steering Committee developed a plan to divide the New England Region into three subregions based on geography and membership numbers. In 1992, SCBW Headquarters approved the proposal, creating the positions Northern New England (Vermont, New Hampshire, Maine) Regional Advisor, Central New England (Massachusetts) Regional Advisor, and Southern New England (Rhode Island, Connecticut) Regional Advisor. A Regional Coordinator would serve as a liaison for the three Regional Advisors. By this time, New England had nearly one thousand members and about thirty critique groups. The Steering Committee also recommended creating several other key positions to relieve the burden on RAs. These included an Editor, a Production Coordinator, and a Subscription Coordinator for the SCBW NE NEWS; a Conference Coordinator; and a Critique Group Coordinator. These volunteers, along with the RC and RAs, formed a Regional Team that began meeting periodically to coordinate regional activities. The initial plan was for each subregion to have a volunteer who would send out welcome packets to new members, but Barbara Barrett agreed to take on this responsibility for the entire region and continued in that position until 2010, when SCBWI Headquarters in Los Angeles began sending their publication, The Book: The Essential Guide to Publishing for Children, to all new members. As important as these changes were for the New England Region, an even more critical transformation took place in the organization overall in 1992. 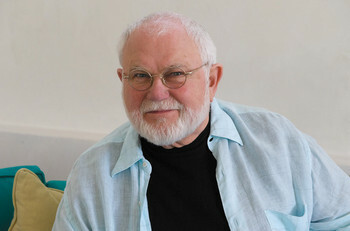 After years of lobbying led by New England author-illustrator Tomie dePaola, the SCBW Board of Advisors voted to change the organization’s name to SCBWI—the Society of Children’s Book Writers and Illustrators. Illustrators had always been among the group’s membership, but now they began to receive the recognition they so clearly deserved. Just as the New England Region was being divided into three subregions, Jane Mruczek learned that she would be moving to North Carolina, and Anita Riggio volunteered to become the first Regional Coordinator. The transition to the new leadership model went smoothly, and during Anita’s tenure, the Regional Team repeated successful programs and developed an exciting variety of new programs, including tours of the Weston Woods Studio in Weston, CT (1991-1997), Nuts & Bolts programs for professional members (1993-1994), a picture book workshop, an author/illustrator teas for educator, and the Whispering Pines weekend retreat at the University of Rhode Island Alton Jones Campus in West Greenwich, Rhode Island. Work also began on Author/Illustrator Yellow Pages, which evolved into the Connections Speakers Directory and was eventually subsumed into the Speakers Bureau launched on the SCBWI Headquarters website in 2013. The mid-1990s was a tumultuous time in children’s publishing, with some publishers downsizing or going out of business and others being purchased by large media companies with shareholders demanding year-over-year profits. But regardless of these industry-related challenges, the New England SCBWI membership continued to mushroom. At the end of 1996, Anita Riggio stepped down from her position as Regional Coordinator and Linda Crotta Brennan, who had served as the Southern New England Regional Advisor under Anita, filled the post. Under Linda’s leadership, the Region continued to offer diverse programming and services, including annual conferences and Whispering Pines Retreats. Additional retreats were offered in Cape Cod and Durham, New Hampshire. The Region experimented with local gatherings, called Schmoozes, in all three subregions as well as a summertime Critique-nic held in Holliston, Massachusetts. 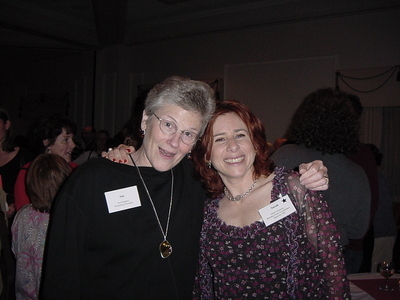 In 1998, Critique Group Coordinator Jan Kozlowski created a Regional website, nescbwi.org. In 1999, volunteer Peter Davis developed a listserv, which quickly and efficiently transmits information to registered members and allows members to connect with one another. 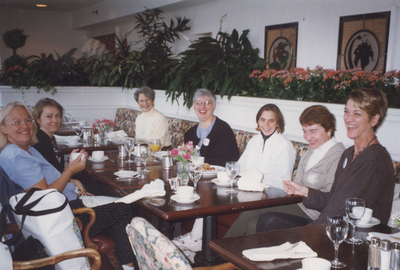 At the end of 1999, Linda Crotta Brennan stepped down from her post as Regional Coordinator, and Marilyn Salerno, who had served as the Central Massachusetts Regional Advisor under Linda, took the helm. 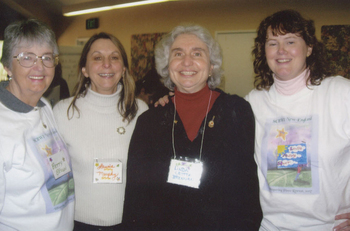 In 2000, Marilyn Salerno received permission from SCBWI headquarters to create four Assistant Regional Advisor (ARA) positions in New England. In other regions, ARAs provide general support to their Regional Advisor. But because New England had a unique organizational structure, Marilyn decided that each ARA should have a specific job function that would serve the entire region. As a result, Jan Kozlowski’s position was renamed Assistant Regional Advisor and Critique Group Coordinator. Margo Lemieux’s position was renamed Assistant Regional Advisor and NEWS Editor. In 2001, Greg Fishbone joined the Regional Team in the position of Assistant Regional Advisor and Webmaster, and Jennifer O’Keefe volunteered to take over responsibility for the Connections Speakers Directory, becoming the Assistant Regional Advisor and Connections Coordinator. These changes strengthened the Regional Team and enhanced its ability to serve the membership as the Internet became increasingly important in the children’s publishing industry. At the same time, the regional leaders and other dedicated volunteers continued to offer programming that had been successful in the past. They also developed a variety of new programs, including Illustrator Days; novel-writing retreats held in Montpelier, Vermont and Shelton, Connecticut; marketing and promotion workshops; critique group workshops funded by grants from the Region; Encore! programs that feature some of the best speakers from past conferences; and salon programs to address the unique needs of published members. In 2005, our Region lost two friends and passionate mentors—illustrator Ann Barrow and writer Ruth Landers Glass. This loss inspired SCBWI New England Regional Team to begin offering scholarships in their names. Their winners receive one day’s free tuition to the SCBWI New England event of their choice during the next calendar year. In 2013, our Region added the Marguerite W. Davol Picture Book Critique Scholarship, to commemorate another beloved, longtime member. In 2009, a national economic crisis resulted in layoffs across the publishing industry and the simultaneous expansion of many literary agencies. These changes, along with the rise of social media and uncertainty about how e-readers would affect the future of children’s books, made for tumultuous times. Nevertheless, SCBWI remained strong. In 2011, Marilyn Salerno received permission to add two new members to the RA Team. Melissa Stewart, who had been organizing programming for published members since 2008, became our Region’s first PAL Coordinator, and Casey Gerard was named Illustrator Coordinator. When Casey moved to California the following year, her position was split into two posts, and Denise Ortakales and Ruth Sanderson agreed to serve as co-Illustrator Coordinators. In 2012, Linda Crotta Brennan developed Book Marketing Groups, later renamed Book Marketing Meet and Greets, to give published and soon-to-be-published members an opportunity to share ideas and plan joint marketing opportunities and events. She re-joined the Regional Team as the coordinator of these events in 2013. 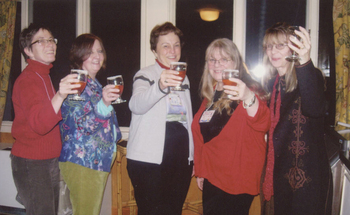 Also in 2013, Regional Coordinator Marilyn Salerno and Regional Advisors Kathy Quimby Johnson, Margo Lemieux, and Sally Riley received approval from SCBWI Headquarters in Los Angeles to reorganize the regional governing hierarchy so that no one person would have more responsibility than the others. As a result, the three Regional Advisors became Co-Regional Advisors, and the Regional Coordinator position was replaced by a fourth Co-Regional Advisor position. Marilyn Salerno became the first Co-Regional Advisor in charge of finances and the annual conference, and the other three Co-Regional Advisors took a more active role in overall planning and decision making. The four-member governing group now discusses everything and makes joint decisions. Today, SCBWI New England has approximately 1,700 members. Through its proud forty-five-year history, our Region has offered more than one hundred and fifty programs to its members. Its annual conference has grown to a weekend-long event that serves more than six hundred writers and artists, and today, more than seventy-five critique groups are available to members in all six New England states. Over the years, our region’s unique combination of programs and resources have created opportunities for untold numbers of friendships to develop and helped SCBWI members throughout New England publish at least 4,540 books for young people and 3,572 stories, articles, poems, games, puzzles, plays, and essays for children or related to children’s literature. The following SCBWI New England members helped to research, write, edit, and design this history of our Region. We thank them for their time and dedication. Kris Asselin, Anna Boll, Linda Crotta Brennan, Sue Burgess, Joannie Duris, Carol Gordon Esker, Greg Fishbone, Claire Mowbray Golding, Linda Mullaly Hunt, Kathy Quimby Johnson, Marianne Knowles, Jan Kozlowski, Margo Lemieux, Jane Mruczek, Jennifer O’Keefe, Denise Ortakales, Ann Marie Divecchia Piantedosi, Sally Riley, Marilyn Salerno, Melissa Stewart, and Jane Yolen. As part of the SCBWI New England History Project, a nearly complete collection of SCBWI NE NEWS, program brochures, and important regional documents has been donated to the Northeast Children’s Literature Collection, Archives & Special Collections at the University of Connecticut Libraries in Storrs, Connecticut. The materials are available by appointment for research purposes. SCBWI New England would like to thank the following members for generously making materials available for the archival collection: Sue Burgess, Joannie Duris, Claire Mowbray Golding, Lee Hoffman, Lynda Mullaly Hunt, Jan Kozlowski, Janet Lawler, Margo Lemieux, Stephen Mooser, Jennifer O’Keefe, Sally Riley, Judy Sabourin, Dana Rau, and Melissa Stewart. In addition, SCBWI New England would like to thank Jeannine Atkins, Betty Brown, Betsy Devany, Josh Funk, Jennifer O’Keefe, Judith Jango-Cohen, Dave and Lita Judge, Jo Knowles, Jan Kozlowski, Mona Pease, Melissa Stewart, and Pam Vaughan for donating photos to this project and Gerard Fairley for scanning images.